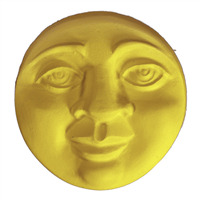 The Moon Face Soap Mold has a design of a circular moon with soft facial features that create a friendly face. Use this mold to create soft lotion bars or soaps. Bar Depth: 1" Bar Length: 2 1/2"
The perfect pair to a sun embed. Set the scene with this beautiful moon embed. 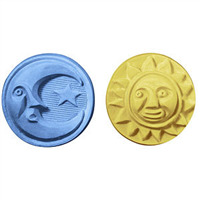 Bar Depth: 0.875" Bar Length: 8.125"
This celestial soap mold features two heavenly bodies, the moon and the sun. 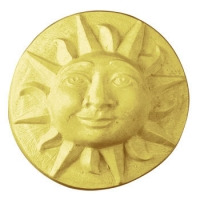 The Guest Sun & Moon Soap Mold is perfect for solstice celebrations, weddings, and the everyday celebration of life and energy. Bar Depth: 1" Bar Length: 2.5"
This celestial soap mold features two heavenly bodies together as a symbol of yin/yang and the balance of life. 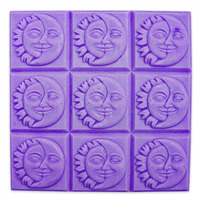 The Sun and Moon Soap Mold Tray makes nine square bars and is perfect for solstice celebrations, weddings, and the everyday celebration of life and energy. Bar Depth: 1" Bar Length: 2.625"
Bar Depth: 1.625" Bar Length: 3"